The Puppy Shelf is built in our workshop out of cedar. It is decorated with puppy wall paper. 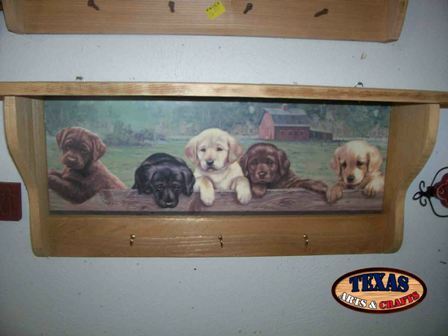 The dimensions for the Puppy Shelf are approximately 10.50 inches tall by 22 inches wide by 5.75 inches deep. The key rack weighs approximately 4 pounds with packaging. For the continental U.S. shipping and handling is included in the listed price. For shipping outside the continental U.S. please contact us through our Contact Us page. The Horse Shelf is built in our workshop out of cedar. It is decorated with horse wall paper. 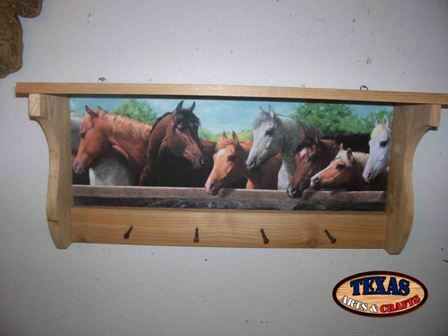 The dimensions for the Horse Shelf are approximately 10.50 inches tall by 22 inches wide by 5.75 inches deep. The key rack weighs approximately 4 pounds with packaging. For the continental U.S. shipping and handling is included in the listed price. For shipping outside the continental U.S. please contact us through our Contact Us page. The Home Sweet Home Shelf is built in our workshop out of cedar. It is decorated with Home Sweet Home wall paper. 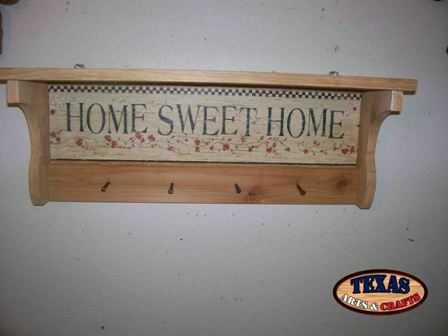 The dimensions for the Home Sweet Home Shelf are approximately 8.75 inches tall by 22 inches wide by 5.75 inches deep. The key rack weighs approximately 4 pounds with packaging. For the continental U.S. shipping and handling is included in the listed price. For shipping outside the continental U.S. please contact us through our Contact Us page. The Large Chicken Shelf is built in our workshop out of cedar. It is decorated with chicken wall paper. The dimensions for the Large Chicken Shelf are approximately 13 inches tall by 22 inches wide by 5.75 inches deep. The key rack weighs approximately 4 pounds with packaging. For the continental U.S. shipping and handling is included in the listed price. For shipping outside the continental U.S. please contact us through our Contact Us page. 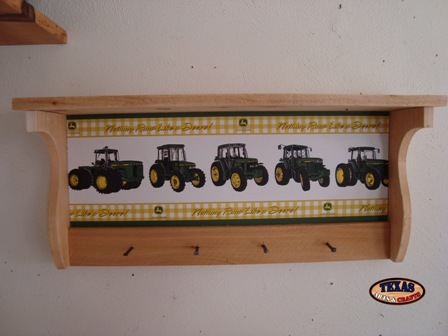 The John Deere Tractor Shelf is built in our workshop out of cedar. It is decorated with John Deere Tractor wall paper. The dimensions for the John Deere Tractor Shelf are approximately 13 inches tall by 22 inches wide by 5.75 inches deep. The key rack weighs approximately 4 pounds with packaging. For the continental U.S. shipping and handling is included in the listed price. For shipping outside the continental U.S. please contact us through our Contact Us page. The American Flag Shelf is built in our workshop out of cedar. It is decorated with American flag wall paper. 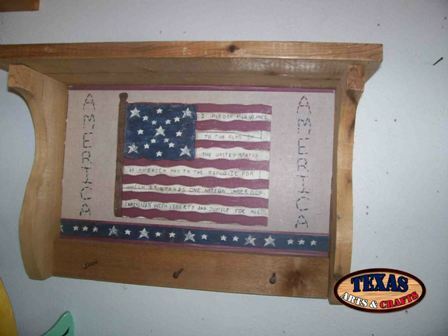 The dimensions for the American Flag Shelf are approximately 12 inches tall by 17.50 inches wide by 5.75 inches deep. The key rack weighs approximately 4 pounds with packaging. For the continental U.S. shipping and handling is included in the listed price. For shipping outside the continental U.S. please contact us through our Contact Us page. The Hunting Dogs Shelf is built in our workshop out of cedar. It is decorated with the hunting dogs wall paper. 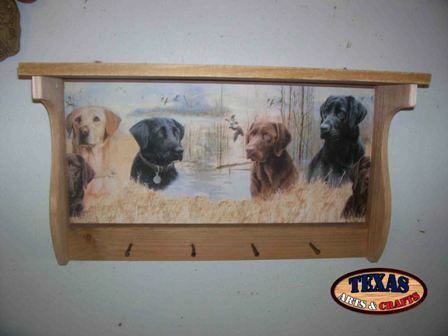 The dimensions for the Hunting Dogs Shelf are approximately 13 inches tall by 22 inches wide by 5.75 inches deep. The key rack weighs approximately 4 pounds with packaging. For the continental U.S. shipping and handling is included in the listed price. For shipping outside the continental U.S. please contact us through our Contact Us page. The Small Chicken Shelf is it built in our workshop out of cedar. It is decorated with chicken wall paper. 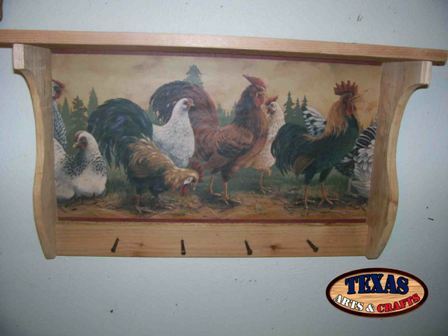 The dimensions for the Small Chicken Shelf are approximately 9.25 inches tall by 22 inches wide by 5.75 inches deep. The key rack weighs approximately 4 pounds with packaging. For the continental U.S. shipping and handling is included in the listed price. For shipping outside the continental U.S. please contact us through our Contact Us page. The Garden Shelf is built in our workshop of cedar. It is decorated with garden wall paper. 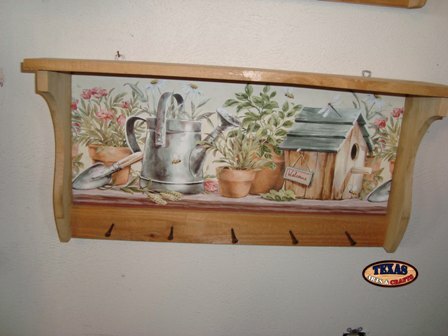 The dimensions for the Garden Shelf are approximately 12 inches tall by 24 inches wide by 5.50 inches deep. The key rack weighs approximately 3.75 pounds with packaging. For the continental U.S. shipping and handling is included in the listed price. For shipping outside the continental U.S. please contact us through our Contact Us page. The Nesting Chicken Shelf is built in our workshop out of cedar. It is decorated with chicken wall paper. 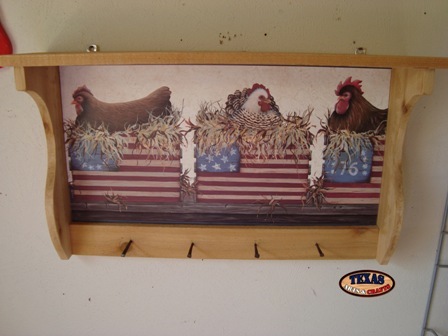 The dimensions for the Nesting Chicken Shelf are approximately 13.50 inches tall by 23.50 inches wide by 5.50 inches deep. The key rack weighs approximately 3.75 pounds with packaging. For the continental U.S. shipping and handling is included in the listed price. For shipping outside the continental U.S. please contact us through our Contact Us page. The Tractor Shelf is built in our workshop out of cedar. It is decorated with Tractor wall paper. 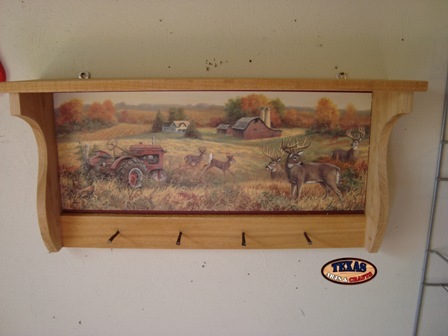 The dimensions for the Tractor Shelf are approximately 11 inches tall by 22.25 inches wide by 5.50 inches deep. The shelf weighs approximately 3.75 pounds with packaging. For the continental U.S. shipping and handling is included in the listed price. For shipping outside the continental U.S. please contact us through our Contact Us page. The Western Cats Shelf is built in our workshop out of cedar. It is decorated with Western Cats wall paper. The cats are all wearing cowboy hats and bandannas in front of a First National Bank Sign. The dimensions for the Western Cats Shelf are approximately 11 inches tall by 22.25 inches wide by 5.50 inches deep. The shelf weighs approximately 3.75 pounds with packaging. For the continental U.S. shipping and handling is included in the listed price. For shipping outside the continental U.S. please contact us through our Contact Us page. 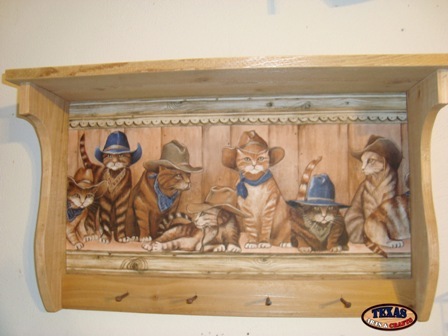 The Cowboy Cats Shelf is built in our workshop out of cedar. It is decorated with Cowboy Cats wall paper. The cats are wearing cowboy hats and bandannas. 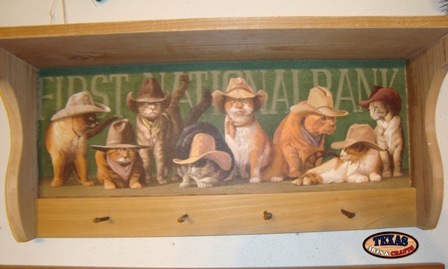 The dimensions for the Cowboy Cats Shelf are approximately 13.50 inches tall by 23.50 inches wide by 5.50 inches deep. The key rack weighs approximately 3.75 pounds with packaging. For the continental U.S. shipping and handling is included in the listed price. For shipping outside the continental U.S. please contact us through our Contact Us page.